Uxbridge-based bespoke furniture manufacturer AR18 approached Glide to help re-structure and improve their internal workflow systems across their businesses. We felt a centralised app would be the best solution to improve project visibly and communication between departments including accounts, workshop floor, management and warehouse. The back-end integrates with the Xero API to determine recently won projects which are then immediately published to the app on the workshop floor for manufacturing. This gives management a real-time snapshot of projects as they progress through the workshop allowing them to co-ordinate and prioritise resources accordingly. Once projects are completed they are pushed to the warehouse app for shipment. Prior to the app AR18 were using a physical whiteboard solution to track projects so the multi-platform application has massively improved productivity and enhanced communication within the business. 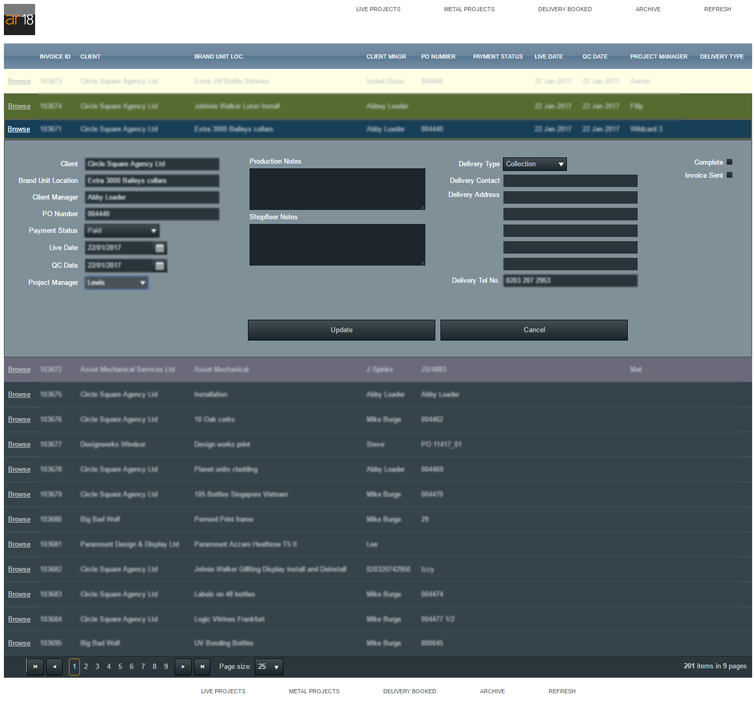 The front-end is customised per department and automatically creates a unique project directory on the server as projects are transitioned from quotes to bona fide sales orders.